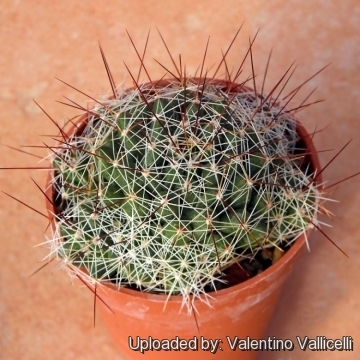 Accepted Scientific Name: Mammillaria decipiens Scheidw. Altitude: 1550 to 2150 metres above sea level. Habitat: This species occurs in relatively low densities across its range, but is fairly common in appropriate habitat. It lives in canyons and on rocky hills, generally in volcanic soils. 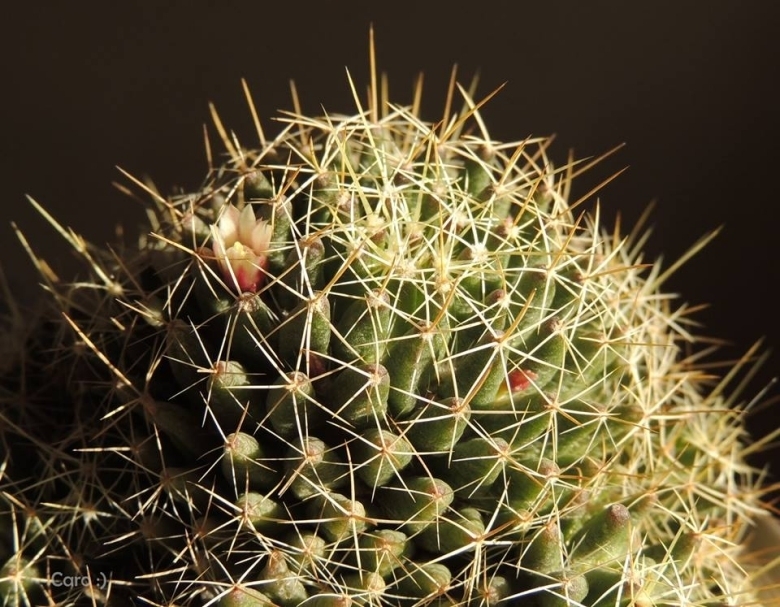 This species is often found in matorral under bushes in association with other plant species, including Opuntia microdasys, Opuntia tunicata, Opuntia leptocaulis, Myrtillocactus geometrizans, Ferocactus histrix, Echinocereus cinerascens, Mammillaria vagaspina, Jatropha spathulata, Coryphantha erecta, Stenocereus dumortieri, Stenocereus pruinosus, Thelocactus hexaedrophorus, Yucca filifera, Agave salmiana, and Agave lechuguilla. 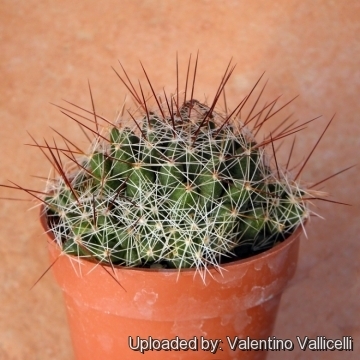 Description: Mammillaria decipiens (a.k.a. Bird's Nest Mammillaria) is a low growing, prominently ‘nippled' cactus species, with long, bristly spines that cross each other forming a sort of bird's nest look (hence its common name). Habit: Usually cespitose, sprouting unevenly from the base and sides, often forming large mounds. Stem: Individual stems, globose to club shaped, rounded at the top, 6 to10 cm high, 4-7(-10) cm in diameter, grass green to deep green. Tubercles: Soft, cylindrical to obtuse, 10-22 mm long 5-7 mm in diameter, their axils bearing or sparse wool and 3 fine bristles each. Without latex. Radial spines: 5 to 11, spreading, 7-15 mm long or as long as 30 mm, bristle-like, straight, slender, white to brownish-white, sometimes yellowish with brown tips, puberulent when young. Central spines: 1-2 rarely none, much longer than the radials, 10-27 mm long, straight, erect or ascending, slender, needle-like, bristly, dark brown. Flowers: 15-18 mm, long, 10 mm across, broadly funnel-shaped, slightly scented; inner perianth-segments nearly white or faintly tinged with pink, acute; filaments white to pinkish; stigma-lobes 4, white or pinkish, slender, filiform. Flower-buds pinkish, acute. 6) Sánchez , E., Guadalupe Martínez, J. & Bárcenas Luna, R. 2013. Mammillaria decipiens. In: IUCN 2013. IUCN Red List of Threatened Species. Version 2013.1. <www.iucnredlist.org>. Downloaded on 21 July 2013. 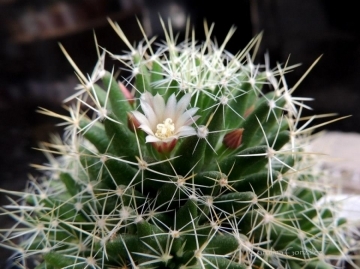 Cultivation and Propagation: Mammillaria decipiens is a freely clustering species that reproduces easily by cutting. 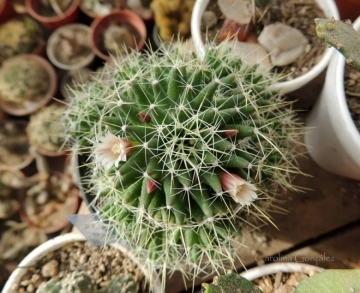 It is a great starter plant for the cactus grower, that readily builds up into a dense cluster of stems. Does better than most species in lower levels of light, but still prefers bright light or morning sun. Repotting: Repotting every 2-3 years, , or sooner if the roots get crowded. . As it is prone to rot under-pot in a smaller container filled with very porous compost. Use pot with good drainage.